Welcome back readers, I must apologize for my absence however it was all in the name of beer. I was away studying for my Certified Cicerone exam, which I wrote yesterday. It will take weeks to learn whether or not I was successful, but I felt pretty good about it. 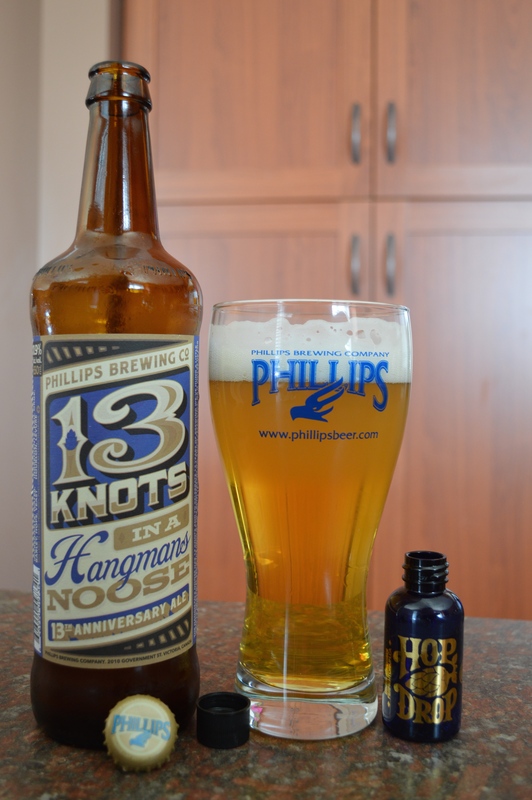 Today we’re having a look at Phillips 13th anniversary beer, 13 Knots in a Hangman’s Noose with Hop Drop. The name alone seems to take nearly thirteen years to say it. In their thirteen year history, Phillips were arguably a major amplifier in Victoria’s craft beer scene and it is undeniable how innovative they have been. This product is such a brilliant example of that innovation. 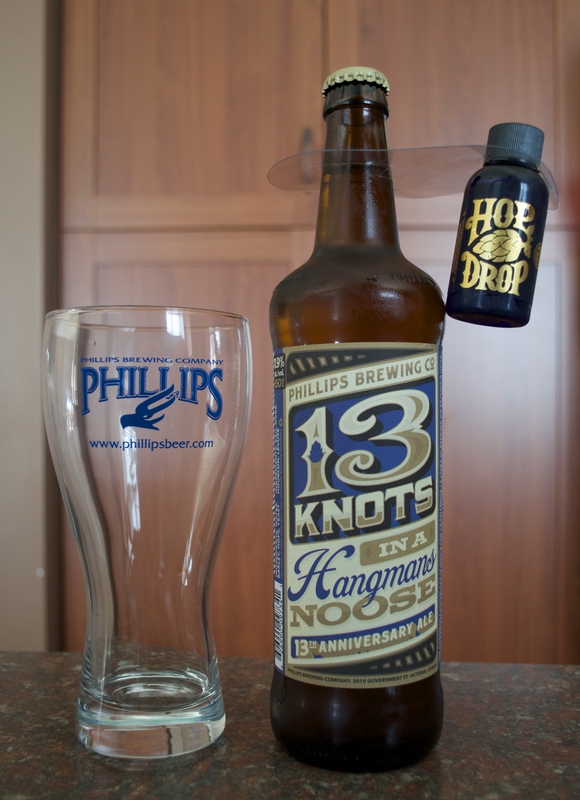 You see, Phillips have been brewing an anniversary beer with an ABV to match their age for a number of years now. However, last year they hit a bit of a snag. Brewer’s pay a tax to the Federal government known as the Federal Excise Tax, at a rate of 3.122 cents per liter of beer under 12% alcohol by volume. Anything 12% ABV and above is taxed as a spirit at 11.676 cents per liter. So essentially a brewer’s tax costs are quadrupled if they release a beer at 12% or more, which is why last year Phillips anniversary beer was precisely 11.9%. A brewer from Phillips swore to me that this was an accurate number and not just made up for the taxman. So what do you do for your thirteenth anniversary and keep the taxman at bay? Simple, you start your own distilling company, make a 29% ABV hop elixir and add it in a cute little airplane mickey as a free gift (just like at Christmas) which when added to the beer makes it exactly 13% alcohol by volume. 100% Legit, 100% Legal, 100% Brilliant. Now, I’m sure you’re saying “As much as I love learning about taxes, is it any good?”. Yes! It’s quite crisp and not surprisingly boozy, with a full-body mouthfeel, and it is as bitter as an internet troll. If you’ve ever chewed a hop cone (I don’t recommend it), you’ll get some of the idea of bitterness I’m talking about. There’s a bit of pie crust in the malts (if you can find them), surrounded by Pacific Northwest hop goodness, pine tree resin, cedar sawdust, and stamp glue (in a good way). Hops dropped. You can see how much heavier the beer is than elixir. The elixir is quite light relative to the beer so I recommend pouring 1/2 a glass before adding the elixir, then topping up with beer. Drink your glass down a few inches and keep topping up until your bottle is empty to enjoy the elixir properly. Well done on the beer to Matt Phillips and all the brewers and staff at Phillips. Happy Anniversary!